We’d love your help. Let us know what’s wrong with this preview of Death by Scones by Elizabeth Ashby. Riley Spencer is officially the new owner of the Cinnamon Sugar Bakery in the small town of Danger Cove. She’s excited about the grand re-opening, but when she learns a hoax letter went out to the residents of Danger Cove informing them of free baked goods, she panics and does the only thing she can—quickly sets out plates of muffins, cupcakes, and cookie bars. Crisis seems to be averted...until the body of local recluse Nathan Dearborn is found in the bakery bathroom. The cause of death: peanut allergy. Riley’s certain not a single item made with nuts left her kitchen, but no one believes her, least of all the police. To save her bakery and her reputation, Riley is determined to figure out who brought in the fatal pastry. With support from her best friend, Tara, and her long-time crush, Jared, Riley discovers secrets from Nathan's past that make her question if his death was truly an accident or something more sinister. With suspects galore, the police breathing down her neck, a love life in turmoil, and a bonanza of baked goods, Riley has her work cut out for her catching a killer...before he strikes again! To ask other readers questions about Death by Scones, please sign up. I've had this on the good old TBR for quite awhile now, and it's about time I got to it. Good thing that most of the Danger Cove novels seem to be very loosely tied to each other, as I've jumped around and not read them in order. This had a very good mystery, but the motive revealed at the end just didn't seem very strong to me. I'm still thinking on it, as I know sometimes someone can be unbalanced enough that anything can tip them over the edge. The mc also at times seemed to fluctuate between I've had this on the good old TBR for quite awhile now, and it's about time I got to it. Good thing that most of the Danger Cove novels seem to be very loosely tied to each other, as I've jumped around and not read them in order. The mc also at times seemed to fluctuate between being a grown-up to being somewhat high-schoolish, especially when it came to romance. These sort of cause my rating to hover between 3.5 and 4. In Death by Scones by Jennifer Fischetto and Elizabeth Ashby, Riley Spencer is having a grand reopening of the Cinnamon Sugar Bakery in Danger Cove to celebrate the fact that her grandmother has formally handed ownership of the bakery to her. Then someone plays a mean prank on her by sending out an email with Riley’s name on it offering free samples to the recipients of the email. Frantically, Riley scurries to the kitchen to cut up pastries baked for the afternoon rush into smaller pieces to gi In Death by Scones by Jennifer Fischetto and Elizabeth Ashby, Riley Spencer is having a grand reopening of the Cinnamon Sugar Bakery in Danger Cove to celebrate the fact that her grandmother has formally handed ownership of the bakery to her. Then someone plays a mean prank on her by sending out an email with Riley’s name on it offering free samples to the recipients of the email. Frantically, Riley scurries to the kitchen to cut up pastries baked for the afternoon rush into smaller pieces to give away, just as the bakery gets inundated by a horde of women. The group gets silenced when Nathan Dearborn, the local recluse, enters, but eventually they resume talking. Then that afternoon Riley goes to use the restroom, only to find Nathan dead of a peanut allergy. Since the bakery makes a point of never using nuts and artificial ingredients, Riley knows this death cannot be an accident. But with her business suffering badly, Riley has to get to the bottom of things in order to save the bakery and maybe her life. An interesting cozy mystry. There are lots of possible suspects, twists and turns, and bits of romance. It ends with a few surprises. My only two complaints were there was too much fashion description. It distracted from the story. Also too many zodiac mentions. The narration was well done. The characters were well portrayed. Melissa Meshey's young voice fit the story. This is book three in the Danger Cove series, this one introduces us to Riley, who has recently taken over her grandmothers bakery. At her grand opening, she finds a body in the bathroom. Unfortunately, Riley eventually becomes a suspect, they say that the man died of an allergy, in her store! Riley knows this is impossible, so she begins to investigate, to save her name, and her store. During the investigation, she uncovers lots of secrets, including some family secrets that make her question a This is book three in the Danger Cove series, this one introduces us to Riley, who has recently taken over her grandmothers bakery. At her grand opening, she finds a body in the bathroom. Unfortunately, Riley eventually becomes a suspect, they say that the man died of an allergy, in her store! Riley knows this is impossible, so she begins to investigate, to save her name, and her store. During the investigation, she uncovers lots of secrets, including some family secrets that make her question a lot of things. After a scary incident at her house, she finally uncovers the truth, and the killer. I was so surprised at who it turned out to be! This is a fun, fast mystery, don't miss this Danger Cove series! I received this audiobook for an honest review. I almost gave up near the beginning of the story because of the narrator. Please, authors, publishers, whoever chooses the narrator, please keep in mind: A bad narrator can make a great story seem like it's not. If a listener can't get past the narrator's lack of skill, this looks bad for the story overall. I hate leaving bad reviews when the majority of the issues were on the narrators part. I'm sorry but the narrator did a horrible job. I see on I received this audiobook for an honest review. I almost gave up near the beginning of the story because of the narrator. Please, authors, publishers, whoever chooses the narrator, please keep in mind: A bad narrator can make a great story seem like it's not. If a listener can't get past the narrator's lack of skill, this looks bad for the story overall. I hate leaving bad reviews when the majority of the issues were on the narrators part. I'm sorry but the narrator did a horrible job. I see on Audible that this was her first time narrating. Wow. Poor choice authors. Even for a new narrator you would have thought she would have brought more to the table, so to speak. 1. There was no change between any character voices and narrator voice (big issue there since it was hard to tell who was talking at times). 2. There was a steady, almost, stilted way of talking on the narrator's part, which meant there were no pauses between scenes. A perfect example, as I saw someone else mention, is when Riley is talking to Max in Nathan's former home and suddenly she's at her house trying on a wig. It was confusing because the narrator provided not a second of pause between these two sentences/scenes. It was one sentence to the next as if she were reading a school report...or IDK what, but she's probably one of the worst narrators I've listened to and I've listened to a lot. Sorry. Overall, this was a cute story and I'd be curious to listen to books 1 and 2. Good job, Authors! I've read plenty of food kind of stories where the author incorporates a recipe at the beginning of each chapter. This was the first audiobook with that concept and I wasn't a fan. If I want to get a new recipe, I'll look it up in a cookbook. I'm listening to a story to listen to a story. All the clothing talk! I get an author wants to help give the reader a visual of what the characters look like, but unless the character's outfit is important or going to become important, skip the overly detailed parts. Riley Spencer inherited the Cinnamon Sugar Bakery from her grandmother. On her first day as the boss, one her customers dies by anaphylactic shock due to a peanuts allergy. Curiously, the Cinnamon Sugar bakery is nuts free so Riley suspects something fishy at hand, and she is decided to find the murderer. Cozy mysteries is one of my guilty pleasures, so I couldn’t let this one pass. The story was entertaining and the characters were interesting enough to keep me invested in the story. Unfortunately the book revolves more around romance than actual mystery solving, which I found disappointing. My guess is that the main character and her friends were in their early twenties, but at times it was like observing a group of teenagers. Their actions were quite childish, and so were their romances. I found this quite uninteresting, and sadly it was almost the main subject of the book. I guess I prefer more mature characters. There is a bit of mystery solving towards the end, but I was so fed up of the dating game of the main character that I wanted it to be finished. I found Melissa Meshey’s narration a bit plain, at times if felt more like she was reading that telling a story or interpreting characters. Her style did go well with Riley but I missed some variations when interpreting the other characters. All voices sounded the same, and I would have appreciated a bit more effort in the character’s interpretations. Following dialogs was difficult at times. In some cases the pauses between paragraphs were very short, making the story confusing, since it seemed that a new paragraph was still part of the previous dialog. There was some background noise at the end of chapter 7, and a repeated sentence around 5:12:33. It was not a bad narration, but Meshey needs to work a lot on her interpretation skills and voice range. It was an okay book but I think it would work better for romance fans. I think it is worth mentioning that this is the third book in a series, but this is the first released on Audible. I find this a weird decision, but I have to say that I didn’t feel that I was missing anything from previous books. Riley Spencer’s first day as owner of Cinnamon Sugar Bakery has started off strange. Just after opening Riley finds out there has been a hoax email sent out to several customers promising free food. She quickly devises a plan to embrace this crowd with smaller bite sized samples. Surprisingly the town’s recluse shows up acting a little bit strange. Riley later finds him dead in the bakery’s restroom. The cause of death was ruled: peanut allergy but Cinnamon Sugar Bakery is a nut free bakery. Riley determined to protect Cinnamon Sugar Bakery’s reputation starts her own investigation only to find out secrets that will change her life. This is the 3rd book in the series but my first book. I had no problem reading this book as a stand alone mystery. The mystery has several red herring to keep you guessing and I found this to be a fun cozy mystery book. I really enjoyed Riley’s quicky nature with her vintage clothes and interest in astrological signs. Riley also a more insecure nature as she worries about disappointing her grandmother, Cinnamon, if she fails at running the bakery by herself. I listened to the audio version of this book and found Narrator Melissa Meshey to be a sweet and young sounding which fits Riley’s character perfectly. She had wonderful tone and diction and brings the book to life. The only problem I had with the audio version is that when the print book contained a recipe between chapters, the audio version also supplied the recipe between chapters. This was a little distracting, I would rather the recipes were supplied at the end of the book. I would recommend this book to other cozy mysteries especially fans of cozy food mysteries. Cinnamon has made it official and turned the keys of the Cinnamon & Sugar Bakery to her granddaughter Riley. Riley is excited for the change and happy to be the new owner. She plans a celebration for the first day. Then her cousin comes running in and warns her that a huge crowd is coming expecting to get free food. Someone, not Riley, had sent out an e-mail inviting people to a free sample party. Then the town hermit, Nathan, comes in and makes a cryptic comment to Riley. Once the crowd die Cinnamon has made it official and turned the keys of the Cinnamon & Sugar Bakery to her granddaughter Riley. Riley is excited for the change and happy to be the new owner. She plans a celebration for the first day. Then her cousin comes running in and warns her that a huge crowd is coming expecting to get free food. Someone, not Riley, had sent out an e-mail inviting people to a free sample party. Then the town hermit, Nathan, comes in and makes a cryptic comment to Riley. Once the crowd dies down Riley discovers Nathan, dead in the bathroom. At first the police say it was just an accident that he ate something with peanuts in it and his nut allergy caused the problem. However since Riley's cousin, and employee, is allergic to peanuts there are no nuts in the bakery. Riley is determined to prove this wasn't an accident. As she starts digging she uncovers all sorts of family skeletons, including her Mom's relationship with Nathan. Turns out Nathan also left her a large pile of money in his will. Will Riley solve the crime before she becomes a victim? I could not get into this book at all. I did not finish it. First off, I listened to this as an audio book, and I don't know what the publisher/author were thinking with the selection of the person who narrated this. She sounded like she was 10 years old, which simply did not work for the story. I couldn't buy the voice I was hearing with the story it was telling. They did not go together at ALL, and it continually distracted me from the story. Normally, I wouldn't judge a book by an audio narrato I could not get into this book at all. I did not finish it. Normally, I wouldn't judge a book by an audio narrator that didn't work for me, but in this case, I also found the writing style of this to be, for lack of a better description, simple and juvenile-feeling. This felt like a young adult story in the writing but it was not a YA book so that was a big disconnect for me as well. Hoo Boy is Danger Cove well named! Death and disaster are the dishes of the day, and I love it! Riley Spencer's Grandmother has decided to retire from running the Cinnamon Sugar Bakery and has handed it lock, stock and flour barrel over to Riley, on the official day when Riley is the one in charge her cousin comes rushing in and shows her an email that has been sent out saying there will be free treats! That is just the start of the day from Hades for Riley though as the next thing is she discove Hoo Boy is Danger Cove well named! Death and disaster are the dishes of the day, and I love it! If you are inordinately detail oriented you will appreciate the minute descriptions of every single change of clothes our heroine employs as well as comprehensive information on everyone else's appearance, outfits, furniture and surroundings. All that attention to her surroundings makes her quite the observant detective. Melissa Meshey's clear, light, chirpy voice [AUDIO] perfectly understated the descriptions as she ran us through the multi-layered plot, doing a good job with vocalizations of v If you are inordinately detail oriented you will appreciate the minute descriptions of every single change of clothes our heroine employs as well as comprehensive information on everyone else's appearance, outfits, furniture and surroundings. All that attention to her surroundings makes her quite the observant detective. Melissa Meshey's clear, light, chirpy voice [AUDIO] perfectly understated the descriptions as she ran us through the multi-layered plot, doing a good job with vocalizations of various cast members. She similarly imparted a number of really yummy sounding recipes quite smoothly. Turns out that I had an ebo I want to visit Danger Cove! Any of the books stand alone very easily, but reading more of them adds layers. The emphasis in this one is the bakery, the new owner, Riley, with her vintage clothes, there are recipes, and, of course, a totally unexpected murder and the investigation. Lots of twists and a few red herrings, and an assortment of romances make this one interesting read. 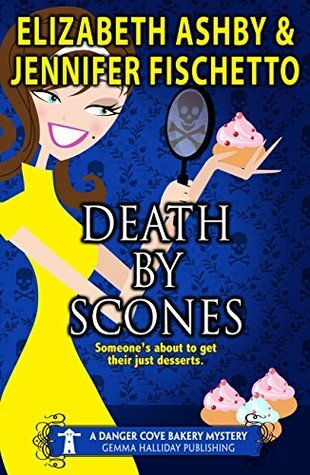 I enjoyed Death By Scones even though it is a pretty simple cozy mystery. Riley, the new owner of the bakery, finds a Mr. Dearborn dead in the bathroom after her grand re-opening. The police think she is responsible and she knows she isn't the mayhem ensues. There are no great ah-ha's in the story, but you will get a recipe and a lot of descriptions of Riley's clothing. Melissa Meshey's voice worked well with the story. I was given this free review copy audiobook at my request and have voluntaril I enjoyed Death By Scones even though it is a pretty simple cozy mystery. Superb. Taking over her grandmother's bakery was a dream come true. However when the opening day was over, a dead body put a dampener on it. Can she clear not only her name but also the bakery off any missing? We're her parents killed deliberately? Arson and personal assults are also thrown into the mix. What with her love life in turmoil what can a girl do. Fight back. Great characters and a vividly painted background. Well worth reading. This one really surprised me. I usually have a pretty good idea who the killer is by the time it is revealed but this one totally took me by surprise. I just didn't see that coming. I hope we see more of Riley in the future books. Good mystery series especially for a cozy mystery. Actually don't know "who dunit" for quite a while and keeps you guessing. This is the third installment of the Danger Cove Series. Gemma Halliday Publishing has another winner in Death by Scones. I love the fact that all these different great authors have come together to write this series. Riley is the owner of Cinnamon Bakery and is having her grand re-opening. With old friends and new stopping by things look like they are getting off to a great start. What she finds after all the excitement has died down may have her re-thinking things. if you love a great cozy myst This is the third installment of the Danger Cove Series. Gemma Halliday Publishing has another winner in Death by Scones. I love the fact that all these different great authors have come together to write this series. Another fun and entertaining entry in the Danger Cove Mystery series! I really am enjoying seeing all of these talented authors come at the 'amateur-sleuth-solves-a-small-town-murder' premise from different angles, with very different heroines. Riley Spencer is the protagonist in Death by Scones (Cute title! ), and her story begins with the grand re-opening of the bakery she's taken over from her grandmother. Riley hopes to do her grandmother proud, but unfortunately finds that there's a double o Another fun and entertaining entry in the Danger Cove Mystery series! I really am enjoying seeing all of these talented authors come at the 'amateur-sleuth-solves-a-small-town-murder' premise from different angles, with very different heroines. Riley Spencer is the protagonist in Death by Scones (Cute title! ), and her story begins with the grand re-opening of the bakery she's taken over from her grandmother. Riley hopes to do her grandmother proud, but unfortunately finds that there's a double order of sabotage on the Cinnamon Sugar's menu. First, when a mass e-mail offering free goodies at the bakery is sent out to everyone in town, then when a patron eats a scone and drops dead due to a peanut allergy despite the fact that Riley's establishment is 100% nut-free. Although the police think the death was just an accident, Riley is sure it was murder and sets out to find the killer. Soon, she's embroiled in all kinds of drama courtesy of the victim's family, and she uncovers some unsettling facts about the deceased that directly affect her. At the same time, she finds herself at the center of a love triangle with two childhood friends that turns into a quadrangle when the crazy ex of one arrives in town intent on causing trouble. Danger Cove has another winner in Death by Scones; I really loved this one, too! I love the idea of a series of interconnected series, lol. Death by Scone is a fast paced mystery with an intriguing and complex plot and a support system for Riley that I love. While I do enjoy a good thriller sometimes, it is the character driven stories that good cozy mysteries present that draw me back time and again and the author in this Gemma Halliday Publishing project do just that. When her first day as owne Danger Cove has another winner in Death by Scones; I really loved this one, too! I love the idea of a series of interconnected series, lol. Death by Scone is a fast paced mystery with an intriguing and complex plot and a support system for Riley that I love. While I do enjoy a good thriller sometimes, it is the character driven stories that good cozy mysteries present that draw me back time and again and the author in this Gemma Halliday Publishing project do just that. When her first day as owner of Cinnamon Bakery (check the make) brings an unwanted surprise in the form of an emailed special invitation to free goodies at the Grand Reopening of the baker, Riley thinks that things couldn’t get any worse. She shifts into gear and addresses that problem only to be faced with a dead body in her bathroom, the body of a local recluse who has obviously died from a reaction to nuts. The problem with that is the bakery has been a nut free zone since an early incident many years ago. To Riley, that spells murder, but the police see it as an accident, but Riley cant let it go. Her snooping opens more than one can of worms, possibly affecting how she has viewed her whole life and definitely affecting her present and her future. I am looking forward to more books in this series. I was sent an ARC copy of this book in exchange for an honest review, thanks to Gemma Halliday Publishing . I will never get tired of saying how much I love the Danger Cove series, each book has been a joy to read, finding out more about the residents and Danger Cove itself. Book 3 centres around Riley the owner of Cinnamon Sugar Bakery, well she is having a grand reopening as she has just been made official owner by her Grandmother and namesake of the bakery Cinnamon who has decided to enjoy her I was sent an ARC copy of this book in exchange for an honest review, thanks to Gemma Halliday Publishing . Book 3 centres around Riley the owner of Cinnamon Sugar Bakery, well she is having a grand reopening as she has just been made official owner by her Grandmother and namesake of the bakery Cinnamon who has decided to enjoy her retirement. But the lasting that Riley expected is a surge of residents of Danger Cove expecting free food and a dead body to turn up in her bathroom! This is a brilliant book, the storyline is fast paced and keeps you on your toes until the end, the characters are well written and likeable, with some yummy recipes thrown in how can you not want to read this book! I'm nutty about this new Danger Cove sweet suspense! Neither Riley Spencer nor her grandma ever used nut products at the Cinnamon Sugar bakery, so how did the reclusive former actor Nathan Dearborn get the nutty scones? The sheriff & deputies are convinced the death was accidental, but the bakery's nut-free reputation is at stake. Business id dropping off, even with al her new exotic recipes. Riley can't seem to keep her mind on the problem while the rest of her is involved in fantasies abo I'm nutty about this new Danger Cove sweet suspense! Neither Riley Spencer nor her grandma ever used nut products at the Cinnamon Sugar bakery, so how did the reclusive former actor Nathan Dearborn get the nutty scones? The sheriff & deputies are convinced the death was accidental, but the bakery's nut-free reputation is at stake. Business id dropping off, even with al her new exotic recipes. Riley can't seem to keep her mind on the problem while the rest of her is involved in fantasies about her hunky high school teacher-crush-friend who might have to become more. Can Tara keep Riley safe from Jared's & her exes until they solve the conundrum of Nathan's nutty scone? If you've not read any of the Danger Cove Mysteries, you MUST! This is the third mystery/adventure set in Danger Cove. Each is a wonderful stand alone book, but they are so very marvelous together. Pick up all 3 and don't quit reading until you're finished with all 3. You'll thank me for the advice! This is a great series; This is the third book in the Danger Cove Mysteries. Each book in this series is written by a different author. I love how each author made Danger Cove into a wonderful town, but brought out each of their different styles. Riley has recently purchased the Cinnamon Sugar Bakery in the small town of Danger Cove. During the grand opening a body is found and the cause of death is caused by a peanut allergy. So the police think that Riley is a suspect since she ba Great Series! This is a great series; This is the third book in the Danger Cove Mysteries. Each book in this series is written by a different author. I love how each author made Danger Cove into a wonderful town, but brought out each of their different styles. Riley has recently purchased the Cinnamon Sugar Bakery in the small town of Danger Cove. During the grand opening a body is found and the cause of death is caused by a peanut allergy. So the police think that Riley is a suspect since she baked everything for the grand opening. It is up to Riley and her friends to find out what really happened. If you are looking for a great mystery then you need to read this book and the other books in this series. I can’t wait until the next book in this series comes out. I enjoyed this Danger Cove mystery even though the bakery made me hungry for a cinnamon roll! The characters were interesting and the mystery certainly wasn't predictable! I liked using characters from other books so that the reader feels like they are a part of the town. I especially liked the advice that sometimes it is what you don't see that matters most. I recommend all the Danger Cover books in order so you know who the different townspeople are. But if you chose to just read one book, the I enjoyed this Danger Cove mystery even though the bakery made me hungry for a cinnamon roll! The characters were interesting and the mystery certainly wasn't predictable! I liked using characters from other books so that the reader feels like they are a part of the town. I especially liked the advice that sometimes it is what you don't see that matters most. When Riley Spencer took over the Cinnamon Sugar Bakery for her Grams, she didn’t count on a murder in the mix—make that the bakery bathroom. As the police begin their investigation, Riley decides to do some sleuthing/policing of her own to save her bakery, her reputation, and her life. Jennifer Fischetto has whipped up a winner with Death by Scones. The characters are as sweet and savory as the lemon pesto muffins and the plot is as heart-stopping as the Death by Mocha brownies. I can’t wait to s When Riley Spencer took over the Cinnamon Sugar Bakery for her Grams, she didn’t count on a murder in the mix—make that the bakery bathroom. As the police begin their investigation, Riley decides to do some sleuthing/policing of her own to save her bakery, her reputation, and her life. This is the second book in the Danger Cove Bakery books and they just seem to be getting better and better. Riley has taken over Cinnamon Sugar Bakery from her Grams, who has just retired. On the Grand Re-Opening Day, a man is discovered dead in the bathroom stall and the police seem to have Riley down as their prime suspect. On top of this, one of her two best friends, Jared, has moved back to town and her boyfriend, Will, is very jealous. I was given an ARC of this book in exchange for an hone This is the second book in the Danger Cove Bakery books and they just seem to be getting better and better. Riley has taken over Cinnamon Sugar Bakery from her Grams, who has just retired. On the Grand Re-Opening Day, a man is discovered dead in the bathroom stall and the police seem to have Riley down as their prime suspect. On top of this, one of her two best friends, Jared, has moved back to town and her boyfriend, Will, is very jealous. Danger Cove Mysteries is a series written by various authors writing about different characters in Danger Cove. In this book we meet Riley Spencer, the new owner of Cinnamon Sugar Bakery. On opening day she finds a body in the bakery's bathroom. This leads Riley on a quest to find out what happened and she also learns some startling facts about her own life. I have really enjoyed all of the books in this series and can't wait to see what happens in the next book. This is a terrific story that will quickly grab hold of you and won't let go! The story is well written, with a solid mystery and a few heart pounding moments. The characters are well developed and likable - people you'd like to get to know. This is the third book in the series and can be read as a stand alone. I look forward to reading more about this town and its residents.